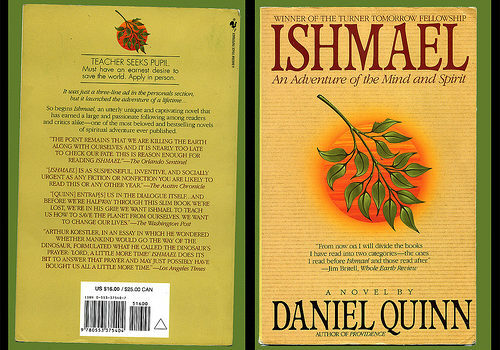 Ishmael is my favorite book. I also think of it as the most important book ever written, something that every single one of us needs to read and attempt to understand. That might sound lofty or over-dramatic, and I understand that it won’t affect everyone in the same way that it impacts me, but I stand by this story; it has more meaningful insight than any religious book in existence. When I read it post-high school, it really did change my life, or perhaps more accurately, it opened my eyes to truths I hadn’t even considered before. And after all these years, I have always been able to go back to it as a foundation for my belief set, something refreshing when the world becomes too heavy. Again, perhaps this sounds grandiose, but I challenge you to read this book and find out for yourself. Our narrator begins by throwing a newspaper in the trash, destroying it because it had the audacity to run an advertisement seeking an individual with an earnest desire to “save the world”. This was so insulted because, simply, that’s exactly what he had always wanted to do, but could never find a way or means or inspiration to do before. Making the short trip downtown in order to debunk this guaranteed fraud of a teacher seeking a gullible pupil, our narrator is instead shocked to find a live, giant, male gorilla behind glass waiting to instruct him on the intricacies of evolution and the destiny of mankind. What follows is a discourse that will change lives and a development of a philosophy that will ring shockingly true. Yes this book moved me (and still does), yes it’s about a man talking to an ape about the flaws of modern civilization, but what is it about exactly, and why should you read it? That’s hard to explain without just saying “you’ll see”, but I’ll try my best. The novel is written in the Socratic style, a teacher & a pupil discussing a topic in logical progression so that each piece makes sense in order in tandem. And the topic of discussion is nothing less than the reason for life, man’s purpose on the planet, and how quickly we will destroy ourselves if we continue to live as if we are more important than every other species on the planet. Heavy stuff, but you will find yourself nodding along, saying far too often, “well huh, that’s right, why haven’t I ever thought of it that way before?” Please read if you are up to the challenge of reframing some popular concepts, of examining the constant cultural hum that rings in our ears as possible myth instead of definite truth.